Our Test Kitchen loves the innovations of the new generation of slow cookers. Slow Cookers are not new, to be sure, but some of today’s models boast features that makes them even more convenient for busy cooks than ever. 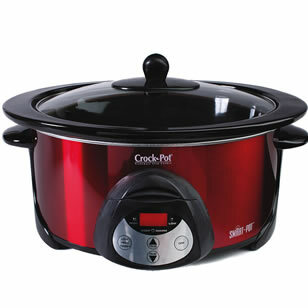 Our pick: A programmable 6 quart Smart-Pot Slow Cooker from Crock Pot ($70). Several bells and whistles make this one a winner: a digital touchpad that allows the user a to control the heat settings and time cooking in increments of 30 minutes up to 20 hours, and the automatic shift to warm setting which allows your meal to cook for its pre-determined time and then switch to a temperature that will keep the food at a safe temperature until you’re ready to eat. Check out our collection of Healthy Slow Cooker Recipes for delicious ways to put your slow cooker to good use.